The above verse states who else will be in their army. * Cush is not modern day Ethiopia as Modern day evangelists are currently teaching. See section ‘Misinterpreting the prophecies of the Jewish right to return’ for more information. The above quote shows you that Jews from the other lands would have joined the Israeli (Gog and Magog) Army (IDF) as stated in Ezekiel 38:5-6. The statistics above are not fully complete as it does not include the full hordes of Gomer, see next section. The above statistics only concentrate on post World War II immigration, i.e. not post World War I - a time when there was immigration, but far less. 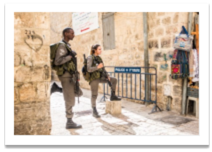 In Israel there are 3 main types of Jewish communities. The Mizrahi Jews are known as the oriental Jews (Middle east & Persia etc.) which includes Libya, Algeria, Tunisia, Iran, Turkey etc. The Ashkenazi Jews are from Russia and Europe. 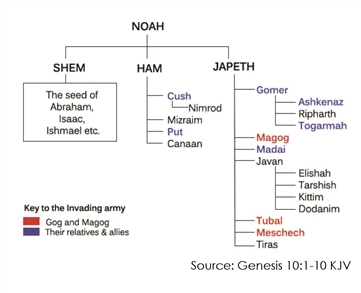 Interesting enough according to the biblical genealogy, Magog’s nephew was called Ashkenaz. Ezekiel 38:6 says “Gomer and all his hordes;” , which means all his large groups, which would probably include his decedents. Notably one of his children is called Ashkenaz, which would explain why Israel has a large amount of Ashkenazi Jews, they are mostly the descendants of Gomer.